For workshops and presentations around the country, see the gatherings page. Read about and participate in Collective Redirection — see pp. 9 and 10 of our newsletter for info about Collective Redirection and a reporting form. 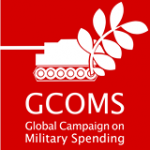 Also, see the Global Days of Action on Military Spending — US information and events list. NWTRCC supports this worldwide effort. International actions are listed here. 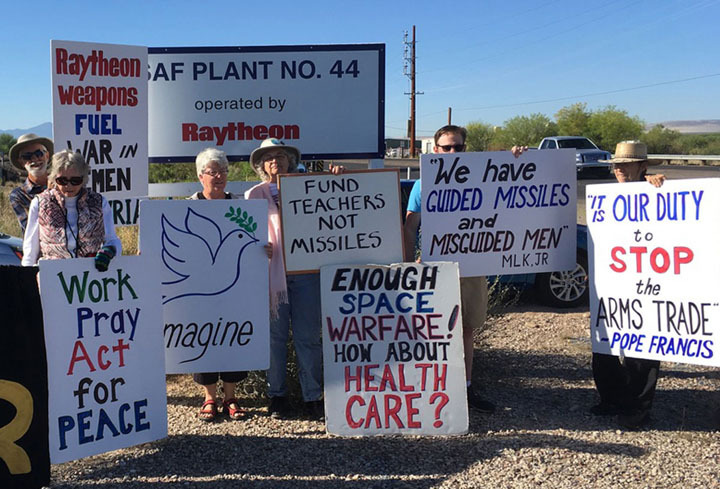 Monday, April 16, 10 a.m.–1 p.m. Women’s International League for Peace and Freedom & Tucson Raging Grannies will be handing out War Resisters League “Where Your Tax Money Really Goes” Pie charts in front of the Wilmot Library. We and we will be talking to folks as they come and go from the library, and the Raging Grannies plan on singing a few songs at noon. Murphy-Wilmot Library, 530 N Wilmot Rd., 85711.You are invited to come for all or part of the time. Bring friends who may be interested. Email for more info. Tax day demonstration 2017. Photo by Felice Cohen-Joppa. Sunday, April 15, 6 p.m. — People’s Life Fund public potluck and awards ceremony at the BFUU Fellowship Hall: 1924 Cedar St. Berkeley CA. (Near North Berkeley BART). The People’s Life Fund is looking forward to redirecting a record breaking $65,000 in resisted war taxes to local peace and justice organizations this year! The evening is always a joyous and inspiring evening, and you are encouraged to come out! See the group’s Facebook page for updates and more information. 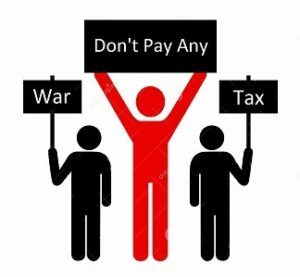 Friday, April 13, 7–9 a.m. Southern California War Tax Resistance (SCWTR) will give the introductory reflection on war tax resistance at the Friday Forum of the Interfaith Committee for Justice & Peace (ICUJP), Immanuel Presbyterian Church, 3300 Wilshire Blvd. 90010. Contact SCWTR for more info: (408) 206-7992. Tuesday, April 17, Noon–2 p.m. A Bake Sale for the Air Force? Hosted by the Peace Resource Center of San Diego envisioning a time when “schools have all the money they need and the air force needs to hold a bake sale to buy a bomber or the Border Patrol a border wall. No time like the present to make this a reality! Join us as we sell baked goods* and show people just what their federal taxes are buying!! Meet us on the sidewalk outside the Internal Revenue Service, 880 Front Street in San Diego, 92101. April 13–16, midday. Flyering on the downtown mall. Look for Gary Erb leafleting with war tax resistance materials. Charles Paidock, (312) 714-7790 or Brad Lyttle, (773) 324-0654. Monday, April 16, 4:30–5:30 p.m. Vigil to catch folks leaving work outside the Federal Building in downtown South Bend. Tuesday, April 17, 5 p.m. Join others to protest the huge inequities in how our tax dollars are used—a bloated military budget while human needs go unmet. Meet at Cowles Commons, 221 Walnut Street. Tuesday, April 17. Leafleting with the “where your income tax really goes” pie chart on a busy corner. To check time and exact location contact Pax Christi New Orleans, (504) 522-3751. Statewide — Contact Maine WTR Resource Center or by Email or (207) 558-5758. Download and print a list of these actions here. Tabling and leafleting at locations around the state. Wed., 4/11, 10 a.m.–3 p.m. University of Southern Maine, Portland, Student Union, with polar bear! Dates TBA — College of the Atlantic; Ellsworth, ME; USM, Lewiston; University of New England Earth month; Bethel. Contact the Resource Center if you would like materials for leafleting or a literature table. Boston — Sponsored by Massachusetts People’s Budget Campaign, Veterans For Peace — Boston, Smedley D. Butler Brigade, Massachusetts Peace Action, American Friends Service Committee. Click on the graphic download the outreach flyer (4 pp). 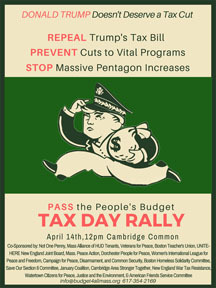 Saturday, April 14, Noon–2:30 p.m. — Cambridge Common, Garden St. and Massachusetts Ave. President Trump’s tax bill is ensuring billions of dollars in profits to large corporations and peanuts to working people. His Pentagon spending will lead to more wars, kill a lot of people, and make us less safe. Cuts in essential programs from Climate protection to Medicaid, Housing, Social Security and Medicare are in the offing. We must turn around Washington’s budget insanity. Join us on Tax Day to call attention to these dangers while promoting our budget priorities to fund the programs we all need. At AFSC, contact Paul Shannon. New England War Tax Resistance will have a table, penny poll, and announce grants from resisted taxes alternative fund. Contact NEWTR to participate with them. Sunday April 15, 1:30 p.m. “A Call to End Endless U.S. Wars” rally and march initiated by Minnesota Peace Action Coalition with many co-sponsors including Minnesota War Tax Resisters. Meet at Lagoon and Hennepin in Minneapolis at 1:30; march steps off at 2 p.m. See paying4peace on Facebook; for more info see the Facebook event. Tuesday, April 17, Noon–1 p.m. Cut War Spending — Fund Human Needs. Vigil and flyering during lunch hour with Tin Horn Uprising marching band in front of Congressman Faso’s office, 721 Broadway, Kingston (next to Broadway Lights Diner). Sponsoring organization: Rise Up Hudson Valley. Email Rise Up for more info. Sunday, April 15, 2 p.m. “End the Wars at Home and Abroad!” Herald Square, 34th Street & 6th Ave. followed by a march to Trump Tower. NYC War Resisters League & war tax resisters will meet at 33rd & 6th Ave., NE corner at 2:30. Rally with speakers including Medea Benjamin of Code Pink, Ajamu Baraka of the Black Alliance for Peace, Chris Silvera, Secretary Treasurer of Teamsters Local 808 and many others. Initiated by the Coalition Against U.S. Foreign Military Bases with many endorsers and similar actions in cities around the country. See Spring 2018 Actions. More info: Springactions@gmail.com or call (518) 281-1968. Tuesday, April 17, Noon–1 p.m. Vigil and leafleting outside the IRS office, 290 Broadway at Duane Street, across from the Federal Building. War tax redirections may be announced. Sponsored by NYC War Resisters League, Sponsored by NYC War Resisters League, Granny Peace Brigade, Catholic Worker, Kairos, World Can’t Wait, Veterans for Peace/Chapter 34, NYC Metro Raging Grannies, Brooklyn For Peace (list in formation). Click “going” on the Facebook event page or for more info call (718) 768-7306. 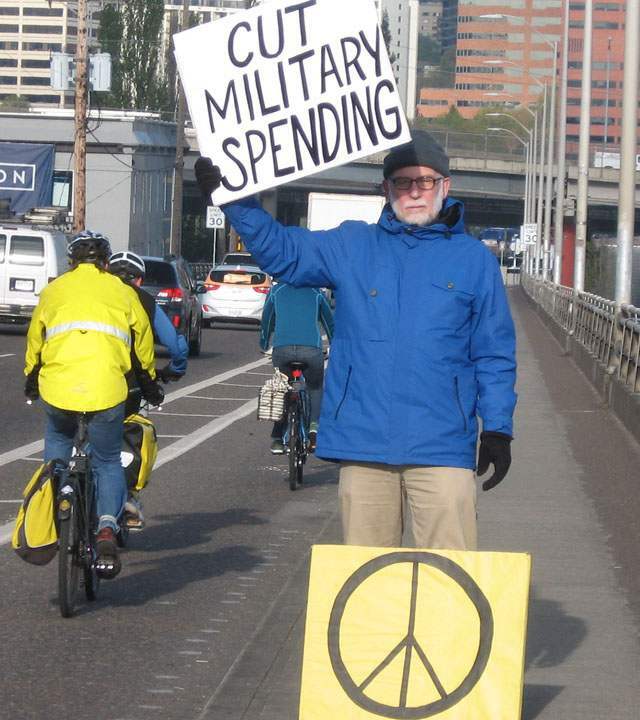 John Grueshow, Tax Day 2015, Portland, Ore.
Portland — Sponsored by War Resisters League of Portland/Oregon Community of War Tax Resisters. Contact Kima at (503) 249-6343 or John Greushow. Saturday, April 14, 11 am. Annual “Burma Shave” style signs on the bridges demanding no taxes for war. Meet at the east end of the Burnside Bridge and MLK Blvd. Eugene — Contact Taxes for Peace! Sunday, April 15, 1–3 p.m. Rally and tabling at EWEB then march to the old Federal Building then on to the new Federal Building and then loop back to EWEB. Speakers, music, Spanish and sign language interpreters, penny poll, and a “bar graph” along the march route showing folks how much of their tax dollars goes to military versus education, environment, etc. Stops along the route will mark points on the graph — showing how far you walk to fund people & planet vs. military. Music and speeches and giving away resisted tax money at the end. Sponsors include Eugene Taxes for Peace!, Community Alliance of Lane County,Indivisible Eugene, and more. See the Facebook event. Tuesday, April 17, 11 a.m.–1 p.m.. Join the Granny Peace Brigade and WILPF at the Broad and Sansom Street Post Office, Center City. We will be polling passersby regarding how to spend our tax money. GPBP sends the poll results to local leaders. Don’t miss the photo opportunity with our own Uncle Sam!!!! Cosponsored by Brandywine Peace Community. Tuesday, April 17, all day, various locations. Help Distribute “Where Your Income Tax Money Really Goes” flyers from the War Resisters League at local post offices. Call LEPOCO (610) 691-8730 to choose your location & time. This is important! Tuesday, April 17, 11:45 a.m.–1 p.m.. Meet at Market Square where Uncle Sam will be asking passers-by to take their tax dollars and “vote” for their spending priorities by placing them in the train car—education, environment, health care—that they want to fund. Sadly, their tax monies will be swept up by “Senator Alexander” and used to fuel his UPF BOMB PLANT EXPRESS. At 12:45 we will depart Market Square, taking the whole train over to Alexander’s office to ask for answers to a simple question: why are you spending our tax dollars on a bomb plant when we need raises for teachers, housing for the homeless, affordable health insurance for hundreds of thousands of uninsured Tennesseans, protections for the environment…???? Tuesday, April 17, 10 a.m.–3 p.m. War tax resistance literature and counseling, plus music appropriate for these times. Outside the Brattleboro Food Coop, 2 Main Street. See the article in the Valley Post. Tuesday, April 17, 7 p.m.–10 p.m. Screening The Pacifist, a feature-length documentary film about Larry Bassett and his massive war tax resistance journey. The film follows his personal progress, reasons and decisions about refusing to pay for war, but the greater themes and messages of the war tax resister movement are front and center. On that day, Larry’s tax resistance total will come to almost $200,000. At Riverviews Artspace. Free and followed by a Q&A with Mr. Bassett and the film’s producer/director, Alex Zhort. For more info see the Facebook event. Tuesday, April 17, 11 a.m.–1 p.m.. Tax Day Action at the Federal Building (915 2nd Ave.), organized by Veterans For Peace, Chapter 92. Tuesday, April 17, 5–6:30 p.m. Tax Day Vigil at the Downtown Milwaukee Post Office, 345 W Saint Paul Ave.. For more information email or call Lincoln Rice — (414) 342-1911.